Continental's pioneering efforts have led to a number of important achievements, and among these was the design of explosion-proof motors. Our motors are intended for Class I, Groups C & D, Class # Groups E, F and G, Division I and II areas. Environments are generally, atmospheres containing volatile substances, including gasoline, petroleum-naphtha, benzene, alcohols, acetone, benzol, lacquer, solvent vapors, propane, butane, and natural gas. Totally Enclosed models employ the same end cap and circulating fan, and are intended for areas where airborne corrosives are present. Continental's explosion proof and totally enclosed motors are available from 100 Hp to 1500 Hp, and can be designed for special voltages as high as 13,800 volts. Standard insulation systems are Class F or Class H with Class B temperature rise as required for UL listing. The motors can be built in vertical or horizontal configurations, and for both fixed and variable speed operation. Continental explosion-proof and totally-enclosed motors are built to meet or exceed all appropriate specifications. Totally Enclosed construction prevents the exchange of air between the inside and outside of the motor case, yet is not air-tight and dust does not enter in sufficient quantity to interfere with satisfactory operation of the motor. Totally Enclosed Fan-Cooled construction includes internal and external fans integral to the motor. A Totally Enclosed Non-Ventilated motor is constructed and equipped for cooling by free convection. Totally Enclosed Air-to-Air Cooled (TEAAC) construction utilizes an external air-to-air heat exchanger to provide cooling. 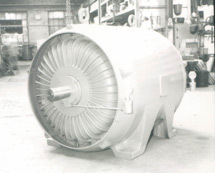 Typically, separate fixed speed fans are used to circulate internal motor air through the heat exchanger and force external ambient air through the heat exchanger. This approach provides maximum cooling efficiency particularly on slow speed ratings and also reduces the rotating mass allowing for improved balance and longer motor life. Totally Enclosed Air-to-Water Cooled (TEAWC) construction utilizes an external air-to-water heat exchanger to provide cooling. Typically a separate fan is used to circulate internal motor air through the heat exchanger. Water is supplied to the heat exchanger through separate customer controlled systems. This approach provides maximum cooling efficiency particularly on slow speed ratings and also reduces the rotating mass allowing for improved balance and longer motor life.